I was looking at thousands of dollars for dental work when I remembered what had helped before, when I had DES-induced cancer and Lyme disease. It was also something I could do at home. Electrocleansing uses resonance to destroy pathogens in the body, which allows the body to heal itself. In my case, harmful bacteria were ravaging my teeth and gums. Electrocleansing wiped them out. Since then, my teeth have been getting stronger and whiter and I no longer have gum pain. "You have advanced gum disease. Your lower front teeth are so weak and loose they may fall out while you're eating. I'm sorry, but these teeth cannot be saved." The dentist was very serious. We had been going over my teeth, one by one. It was looking like I would need both upper and lower dentures. I was prepared for the announcement that I might need a tooth capped or pulled. But dentures? How could this be happening? I had been told by other dentists that if I took good care of them, I would probably keep my real teeth. But now as I approached 60, it appeared my teeth were succumbing to gum disease. 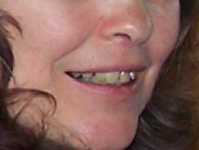 I couldn't accept the brutal solution being offered - yanking out tooth after tooth and replacing them with false teeth. I rushed out for a second opinion. The next dentist was more optimistic - or perhaps just more cunning. "We can try to save your teeth," he said. "We will deep clean the gums every three months. It would include scaling and root planing above and below the gum line." This painful, barbaric procedure tears up the gums and costs over seven times as much as a normal tooth cleaning. And it is done twice as often. A friend of mine went to the same dentist and opted for the deep cleaning. She had dental insurance. Afterward, she said her gums were so sore she could barely eat anything for weeks. After almost a year of deep cleanings, many of the teeth could not be saved and she had to have them pulled. It is often a blessing to live a simple, debt-free life. I refused to go in the red for deep cleanings or have my teeth pulled and replaced. So I set a simple goal. Could I use natural methods to keep my teeth for another year? I doubled my brushing and flossing regimen. I also started searching the Internet for natural solutions to heal gum disease, and purchased a few products that sounded promising. All of them were a disappointment. One even caused my mouth to break out in sores. Meanwhile, I watched with horror the progression of this dreaded disease called gingivitis. One morning I looked in the mirror and saw that my gum had lifted away from my front tooth, revealing the root. For the first time I understood that old saying, "She is long in the tooth." Night after night I had terrifying dreams about losing my teeth. In one nightmare I raised an apple to my mouth and as I bit down, four of my teeth loosened and came out, attached to the apple. A few days later my teeth had turned a ghastly gray. Yes, I knew what was happening. My teeth were dying. As I had been warned, if I didn't have my teeth pulled, they would fall out on their own. Despite all my souped-up hygiene, my bottom front teeth were unusable because they were so loose. My gums were sore and I had a low grade toothache all the time. This was a dark, dark time for me. What a miserable experience, and the sad part is, I knew I wasn't alone. People get gum disease every day. "Oh God," I prayed, "I must let go and let You lead me to victory. I know it is often through our suffering that we see what would not otherwise be revealed." God is ever faithful. Sometimes the solution is already in your possession, and all you need is a reminder. When all else was failing, it was brought to my remembrance the device we had used years ago to heal me of cancer and Lyme disease. Could it help with gingivitis? It was a far cry, but nothing else was working. 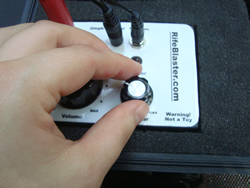 The machine uses Rifeblaster technology to do Electrocleansing. High voltage resonant frequencies destroy bacteria and viruses. I went to the Electrocleansing computer program that displays a pop down menu of disorders. I selected Gingivitis from the list, put a pad on each cheek, and gradually turned up the volume to a comfortable level. I can't tell you what a wonderful sensation it is to have this pulsing energy attacking bacteria right where it hurts. I went to bed that night and slept better than I had for months. I continued Electrocleansing every three days for a week, to catch any bacteria that might be hatching. It didn't take long before we began to see serious results. My lower teeth, which had become so loose that they were "floating" in my gums, suddenly hardened into place. The pain faded away. My temperature returned to normal as the infection subsided. It seemed impossible, but gradually the symptoms became less severe, and eventually disappeared altogether. I am convinced that if I had not done the Electrocleansing, I would probably have lost my teeth. Instead, Electrocleansing apparently killed the invading microbes and my gums were quick to heal. And those loose bottom teeth - they tightened so fast that they are now crooked. But I don't mind. The tissues have re-attached to the teeth, the bleeding and inflamed gums are gone and I can chew raw carrots, apples, and popcorn with no discomfort. Yes, my teeth still show signs of being ravaged by gingivitis and my smile suffers. I have not, as yet, been able to correct the damage done, but I have stopped the progression of the disease and my teeth are growing whiter and stronger. About six months after my initial Electrocleansing sessions, I had another toothache on the other side of my mouth. My cheek swelled up and partially obscured my vision. I assume it was a tooth abscessing. This time I was quick to hook up the Electrocleanse machine. After just one session, the swelling went down and I slept peacefully. I did a couple more sessions to make sure I thoroughly cleaned out the "tiny foes" and have had no more trouble for the last six months. I have met my goal of keeping my teeth for one full year. I'm hoping to continue Electrocleansing when I have toothaches or gum pain. Right now I have functional teeth. They have weathered a severe storm, and the damage is apparent, but if the bacteria can't get a foothold, I am hopeful that my teeth can continue to survive.